So temperatures are finally rising here in the U.K with the highest being about 30 degrees. It feels crazy almost feels like being in Pakistan. 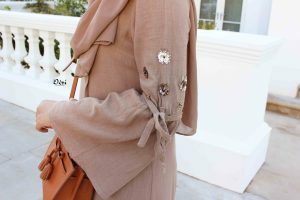 Being a hijabi the heat can sometime be unbearable because if our dress has no sleeves then we have to layer and wear a t-shirt and you don’t want to be doing that in this heat! I find the most perfect thing to wear when it’s super hot is abayas. As long as it’s not see through you can get away with wearing literally nothing underneath and it feels amazing in the breeze. Below I’m wearing a dress from Pop Look, which could pass off as an abaya too since it’s super modest. I got sent a few items from this company to promote on my Instagram but this one wasn’t for promotion they just sent it extra as a gift and honestly it was the best item they sent me. The dress has the cutest bell sleeves which is embellished with sequins making small little flower shapes. The sleeves also have a little tie which just gives it a more fitted look. The dress is not see through at all and that’s probably the best thing about it! The only thing I will say about Pop Look items is buy a size larger then your actual UK size. I’m a size small but since this company is from Malaysia the women there are naturally a little smaller so sizes are one seize down compared to UK sizes. I wished I had known this earlier so I would have ordered this in a size medium since it is actually quite fitted around my hips. 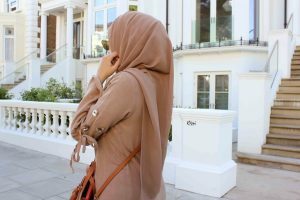 My hijab is from Whitechapel market, if you’re from London you’ll know this is hijab heaven, they have such an amazing variation of hijabs at affordable prices. If you’re from outside London the top three companies that I have bought hijabs from are Inayah, CherryBlossomHijabs and HijabJewels. 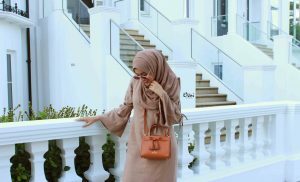 All three companies in my opinion produce top quality hijabs and always have an interesting variety to choose from. 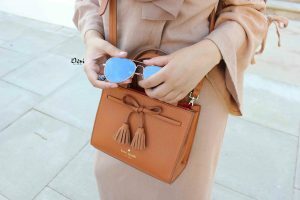 My cute little tote bag is from Kate spade and the glasses are from a stall on Oxford Street.